Around the world with fun, small plates paired with novel wines. : It may be hard to see the sign for this spot, but the crowd brimming from the entrance is a dead giveaway. Diners flock here for tasty, far-flung small plates --- to share or not. Under “locally grown,” choose Liberty Farm duck with smoked cheddar polenta or sautéed Brussels sprouts with sausage and Pt. Reyes Blue. Take crunchy truffled fries for a French dip in truffled aïoli, or cross the Mediterranean for Moroccan-style lamb chops cloaked in a honeyed barbecue sauce, and deeply caramelized Tunisian roasted carrots with pine nuts and mint. Asian-inflected dishes include five-spice pork belly pot stickers, and short ribs met with quince chutney and long beans. Latin America represents with curried crab tacos with apple-cucumber-mint salsa. Wine allows more sampling possibilities, with two-ounce, five-ounce and half-bottle pours, perhaps from the “something completely different” category. No matter what style of wine you choose, there's sure to be a savory dish that partners nicely. 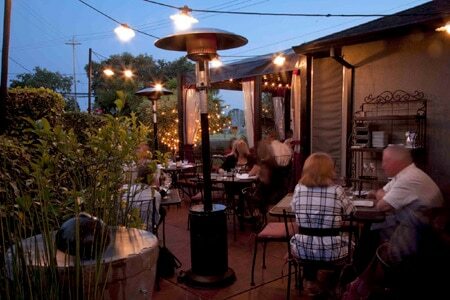 Willi's is a good spot for a cozy rendezvous --- inside or out on the pleasant patio.